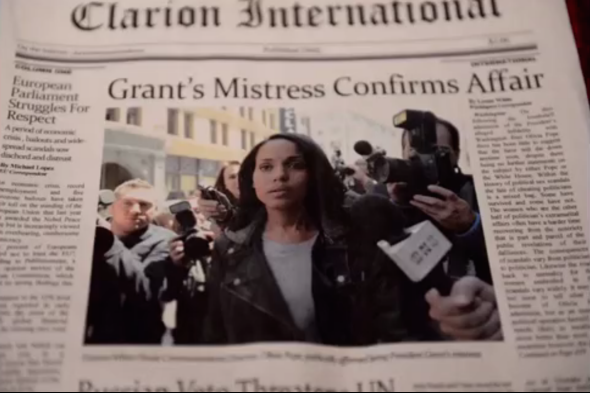 Scandal’s “Dog-Whistle Politics” took on Alessandra Stanley’s “Angry Black Woman” New York Times piece (VIDEO). Thursday night’s Scandal took last year’s controversy head-on. Remember last year, when then-New York Times TV critic Alessandra Stanley wrote an outrageously tone-deaf piece in which she referred to Shonda Rhimes—arguably the most powerful showrunner in Hollywood—as an “angry black woman”? And in that same piece, deemed How to Get Away With Murder star Viola Davis to be “darker-skinned and less classically beautiful” than Scandal star Kerry Washington? Shonda Rhimes does. Stanley’s article caused an immediate backlash in the media, with plenty of critics and fans calling her and the Times out for the piece’s shortsighted and backhanded assessment masquerading as praise. Rhimes (along with Davis) has since responded several times over social media and in the press, condemning the article while also expressing relief that the pushback was so swift. But as far as I can tell, Thursday’s episode of Scandal was the first time the showrunner has addressed the issue head-on through her characters—and she didn’t hold back. In the episode, titled “Dog-Whistle Politics” (spoilers follow), Olivia Pope has already revealed to the public that she is romantically involved with the president, and the press is having a field day digging through her past and tearing her down. Talking heads craft a narrative of Olivia as a woman who achieved success in Washington because of an ambitious father who instilled in her a “manufactured sense of privilege”—sending her to a prestigious boarding school—and a penchant for dating powerful, older men. Her political stature is gawked at, viewed as an anomaly: At one point, one character recalls overhearing a random woman say that Olivia “pulled herself up by her bootstraps and made it out of the ghetto.” All the racially-charged language starts to sounds a little like Stanley. She’s usually so ‘well-spoken’ for a black woman, isn’t that what you meant? I say that because I’ve been looking at the last 72 hours of your station’s news coverage, and when you’re not suggesting Olivia Pope is an angry black woman, you’re implying she’s a homewrecker who slept her way to the top. Scandal has dealt with race many times over the course of its five seasons, sometimes deftly (a client automatically assuming that Abby, who is white, is Olivia “the fixer,” not Olivia herself, the black woman in the room) and other times more clumsily, as with last season’s pat attempt at a Ferguson-inspired storyline. Interestingly, Marcus was first introduced in that episode, pressuring Olivia to represent the black community and help bring to justice the white cop who shot an innocent, unarmed black kid. In “Dog-Whistle Politics,” he’s used much more effectively and in a much more nuanced examination of all the complexities that come with being a black woman in America. It’s important to note that while the episode seems largely inspired by Stanley, the Times writer is hardly the only one who needs to hear its message. As the most powerful showrunner in television, Rhimes has undoubtedly had to deal with coded language all the time, and perhaps that personal experience is the reason she was able to make it work so well. Unlike the Ferguson episode, which took on more obvious, unmitigated racism that only served to oversimplify the event it was trying to recreate, “Dog-Whistle Politics” is more damning, more charged, more personal. It exposes the convoluted way we talk about race and people of color for how pervasive and damaging it really is.